Choose from the ghd hair straightener range to complete your kit of styling essentials. From waves and curls, to flicks and poker-straight hair, create a look that’s stylish, effortless and professional with our ghd straighteners. The range of ghd hair straighteners will help you to create a multitude of hairstyles, producing shape and movement in each styling session. The ghd platinum® styler gives you the perfect finish using our patented tri-zone® technology that maintains a safer-for-hair heat from root to tip, reducing hair breakage by over 50%* and increasing shine by 20%**. So now your hair can be stylish and healthy – all in one stroke. 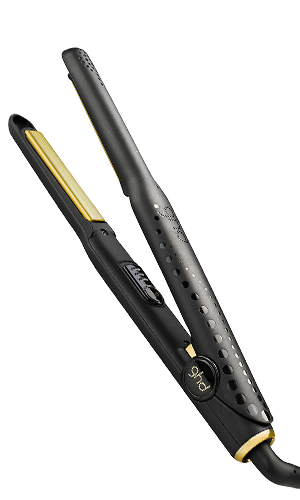 Alternatively, select the ghd V gold max styler, which is the perfect straightener for long hair. With its cooler, lighter body and smoother plates it will glide through your hair to give you a salon finish every time. Our take on the perfect Classic offering glimmering gold accents and plates and an enhanced design give the ghd V gold classic styler a luxe feel. Smoother gold plates glide effortlessly through the hair to make straightening on all hair types and lengths even quicker and easier, while their contoured edges help to create perfect curls and waves, all with a high shine, salon-style finish. Ask your Millimetre stylist which ghd is right for you.